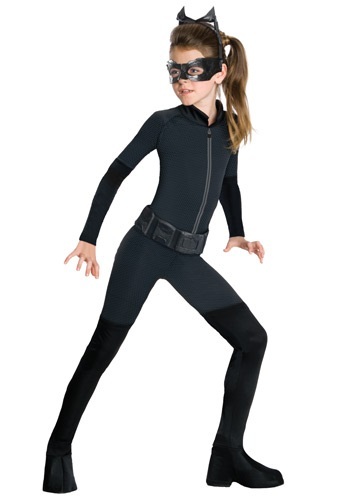 Child Catwoman Costume By: Rubies Costume Co. Inc for the 2015 Costume season. Selina Kyle has spend years robbing the rich and giving to herself, because to this sly burglar if she can make it her it should be. There is only thing standing her way of getting everything that she wants, Batman. The dark knight has time and time again foiled her plans when robbing mansions. But when Bane threatens all of Gotham City Catwoman and the caped crusader have to team up to make sure their town survives. Now your little girl can look like her favorite villainess in this awesome outfit.